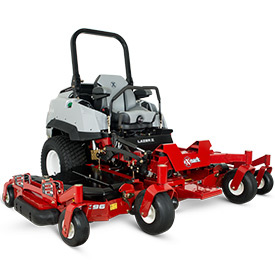 Exmark raises the bar for commercial zero-turn productivity with the 2018 Lazer Z Diesel. Available with a new 96-in. UltraCut Flex Wing cutting deck and RED Technology-equipped Yanmar liquid-cooled diesel engines, the new machine is capable of cutting more than 10-acres per hour. Designed to reduce operator exposure to bumps and vibrations, the diesel has a full-suspension operator seat and features isolation mounts under the seat base and footrest, and within the motion control system for all-day comfort. Lazer Z Diesel models are also available with a choice of 60- or 72-in. UltraCut cutting decks, in side- or rear-discharge configurations.